The influences of zinc dimethacrylate (ZDMA) contents and three different sulfur systems, i.e. 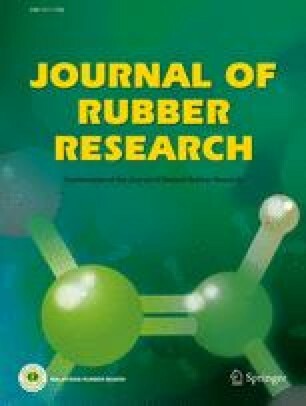 conventional, semi-efficient, and efficient vulcanisations or CV, semi-EV and EV, respectively on crosslink densities and comparative properties of styrene-butadiene rubber compounds containing a fixed amount of peroxide used as an additional crosslinkerwere investigated. The results of cure characteristics and total/specific crosslink densities in different linkage types clearly confirm that, besides synergistic effect of ZDMA towards improved peroxide cure, the extraordinary ionic crosslinks can be generated by this substance, leading to considerable rises in modulus and strength of vulcanisate. However, its ionic-crosslinking efficiency is potentially lessened with increasing sulfur proportion. Elasticity indicated by loss tangent and heat build-up of vulcanisate increases with increasing ZDMA contents due to a higher total crosslink density. The overall properties of CV-based compounds have shown to be independent on ZDMA loading levels. Semi-EV and EV systems provide superior thermal ageing resistance to the vulcanisate compared to CV system due to a greater proportion of short crosslinking bonds: mono-/disulfidic, and carbon-carbon linkages, in EV and semi-EV cured stocks. In addition, the increment of ZDMA contents appears to improve heat-ageing properties of the vulcanisate, attributed to a better thermal stability of ionic crosslinks.